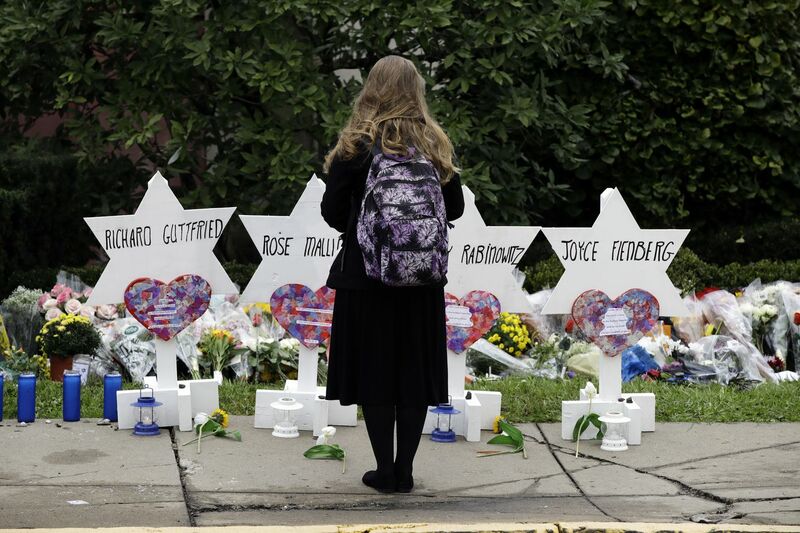 A person stands in front of Stars of David that are displayed in front of the Tree of Life Synagogue with the names of those killed in Saturday’s deadly shooting in Pittsburgh. Yet again the nation is mourning a mass shooting in a place we thought was safe — a synagogue on shabbat — in Pittsburgh. For me, this time feels different — it was a synagogue, it was Jews who were targeted, I know many people who live in that very neighborhood and who call Tree of Life home. But really, this time is no different. Whether it is a synagogue, a church, a mosque, a Sikh temple, an elementary school, high school, college, night club or any of the countless other spaces that have been devastated by gun violence, all these places are the same. In America, we have forfeited our right to feel safe and be safe in the places where we go to work, play, learn, and pray. More accurately, our elected officials have forfeited that right for us. They've decided that easy access to firearms is worth the price we pay — 33,000 American lives a year, almost 96 a day. And as long as those officials continue to be elected, they are hearing us say that price is acceptable. If you believe that price is unacceptable and that American gun violence is a problem we can solve, then you need to send a different message. Especially right now with Election Day just a week away. If you want to send them a new message and tell them loud and clear that you expect them to make us safer and to fight gun violence, if you want them to know that the price we're paying is unacceptable, please call your elected officials and those running for office. Have you — or will you — sign on to gun-violence prevention measures, such as closing loopholes in our background check system that allow the private sale of long guns — including the AR-15 used at Tree of Life — without a background check in Pennsylvania? Will you work to reinstate a ban on semiautomatic rifles and high-capacity magazines — the weapons of choice for mass shooters? Will you work for such measures as an Extreme Risk Protection Order that allow family members to petition a court to temporarily bar access to firearms by a loved one in crisis? Will you vote for party leaders who are pledging to bring gun-violence prevention measures to a vote? Will you get your colleagues — in your party and across the aisle — to partner with you on these initiatives? Harrisburg and Washington won't change unless we force the change. The easiest thing for them to do is nothing. I believe our gun-violence problem is solvable. But we have to want to solve it. If you agree, make your voice heard. This is the moment — those elected officials, and those candidates, are listening right now. It's time to choose the message we send. You can speak loudest in the voting booth on Nov. 6. Shira Goodman is executive director of CeaseFirePA, Pennsylvania's leading gun violence prevention organization.